Many families are struggling to be financially secure. A Prosperity Now study found that more than one in four Iowans have virtually no savings, according to Radio Iowa. Deb Schroeder, vice president, community outreach and education at Dupaco, is not surprised that Iowa has fallen from seventh to 14th place in overall financial security. “As we go out, we are finding it to be more and more common that people are struggling to understand what impacts their overall financial status,” she says. Placing an emphasis on the power of financial education, Dupaco is working to empower more members to have financially secure futures. When members review their entire financial picture side by side with Dupaco, they learn how to cut costs and build systematic savings into their budgets. “We are really teaching our members that every penny you earn needs a home,” Schroeder says. The Credit Coach Loan helps those with no credit or damaged credit drive up their score. The money borrowed is secured in the member’s savings account during the term of the loan. “Not only does it help you improve your score, but at the same time it’s teaching the habit of saving,” Schroeder says. The matched savings program helps low-income members purchase a specific wealth-building asset, such as a home or vehicle. The participant’s savings are matched by a grant. Through Shine Online and Mobile Banking, members have free access to both their credit score and credit report. 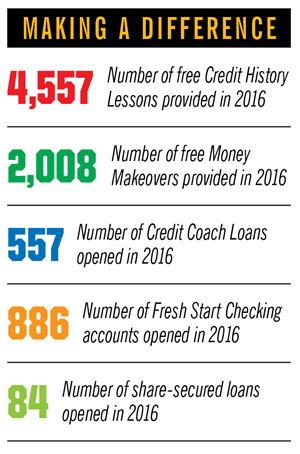 Bright Track teaches members how to drive up their credit score and alerts them to potential identity theft. Members can easily keep tabs on their account activity, including transactions, withdrawals and low balances, through email or text alerts.